5 Luxurious Upgrades To Your Outdoor Kitchen! As summer comes to an end, northerners are mourning the loss of the warmth and long days of summer. As for Floridians, our outdoor activities continue on, and in slightly cooler weather! Summers in Florida can get unbearable and your outdoor space may not have gotten as much use as you expected. Now that the temperature is moving to the cooler side, it’s the perfect time to invest in an outdoor kitchen. Think about it, less mosquitoes, more bonfires (for roasting marshmallows of course), and no one will judge you when you buy 5+ pumpkins to make your space festive — because it’s finally October! To get in the fall-festive spirit, here are 5 luxurious upgrades to enhance your outdoor kitchen. One: Make outdoor life easier with a Pot Filler! Your outdoor kitchen is meant to be just as convenient as your indoor kitchen and if the family is outside enjoying themselves, why should you be in the house cooking the pasta? Adding a pot filler to your outdoor kitchen will eliminate the muss and fuss of going back and forth between the kitchen and outdoor kitchen which allows you to be part of the outdoor fun with the family. Two: Give your backyard BBQ an upgrade with a Smoker! There is nothing better than barbecue especially when you have the delicious smell overtaking your backyard. A smoker makes all the difference in every family gathering from a college football party to Wednesday night family dinner, especially in the fall! Three: Sizzle things up with a Fire pit! I know what you’re thinking, “A fire pit in Florida? Really?”, yes really!! Not only is a fire pit a cozy source of heat during cold snaps, there is one delicious treat that is fitting for all year round celebrations, s’mores of course! Does this one even need an explanation? It’s pizza! But seriously, a pizza oven won’t only make you and your family happy campers, but if you ever decide to put your house on the market, pizza ovens will earn great selling points! Five: Fall, Oktoberfest, and a Beer Tap! When many think of the fall months, beer is one of the season’s greatest pleasures (along with pumpkin spice lattes) that immediately come to mind. Make your backyard the place to be this fall and all year round by adding a beer tap to your outdoor kitchen. 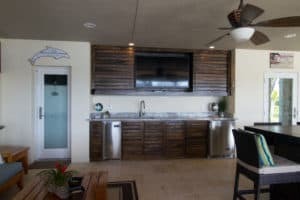 Two other stylish and functional upgrades that you can add to your backyard oasis are televisions to watch the big college game (while enjoying homemade pizza) and under counter lighting! Like under cabinet lighting, you’ll be able to see what you’re cooking and they’ll light your way to the table.